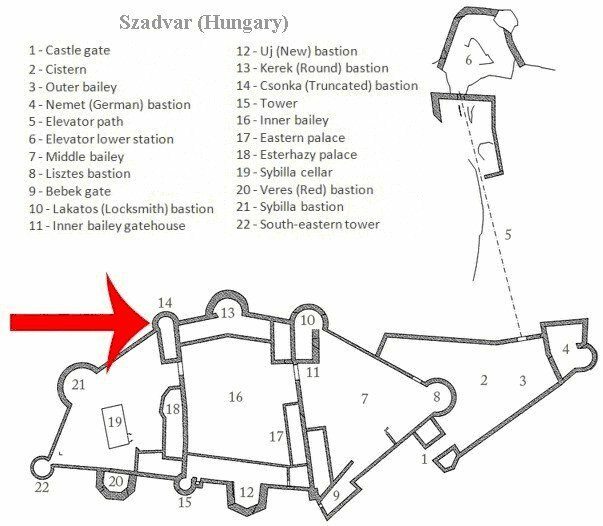 The earliest historical source which mentions the castle of Szadvar as “Szard” was 750 years old this year. But the castle is known to be way older. The members of the ‘Friends of Szadvar’ association kept coming back to this place in the last 8 years. It definitely needs more time to save the castle but we believe we have already made considerable progress. 2014. Yet another successful year for the Friends of Szadvar! A year ago we started a Hungarian online magazine on our website to draw some attention to the medieval castles and to our activity as well. The articles are issued monthly and are written by either members of the association or archeology and architecture experts who are willing to support us with their thoughts and writings. We are glad that it turned out to be a successful initiative. We held our 16th ‘Save the Castle days’ event in March. More than 25 people travelled from around the country to Szadvar again. This time the goal was to collect as many loose stones as we could around the inner bailey, of course without removing any parts of the remaining walls. These stones were used as building material for the conservation of the Csonka (Truncated) tower. We had a nice time and we managed to collect quite a big pile of rocks and stones next to the construction area. Since Szadvar castle is located near to the Slovakian border it was a restricted area between 1920 and 2006. Therefore this place was deserted and almost forgotten. One of our goals is to propagate and make this castle better known even in Hungary. So it was a great opportunity that Castrum Bene, the nationwide known Hungarian association of archeologists, historians and architects accepted the invitation of the local government of Szögliget village and the Friends of Szadvar. Close to a hundred people came to the village not only from Hungary but from Slovakia, too. They were staying in Szögliget between May 2-4th and they visited some places in Slovakia. The presentations were in Hungarian and in Slovakian, too, helped by interpreters. We received good feedback, the conference was very successful. We hope that this event provides good publicity of our efforts and results in saving Szadvar. Frigyes König, President of the Hungarian University of Fine Arts acceded to our request to draw and paint the castle as it may have looked like in the 17th century. After studying old prints and old inventory data of the castle he had created 12 beautiful paintings. His work was issued in our first publication about Szadvar with the support and help of Civertan Bt. (www.civertan.hu). Up to 60 volunteers – including archeology students and children, arrived to the Szalamandra tourist house under the castle hill in August. These people were working on the excavations led by the archeologist Viktor Gal (representing Herman Otto Museum of Miskolc) who had set out 7 different locations to dig. This year the excavations were focusing on the areas around the remaining walls which are still standing around the inner bailey. These walls are planned to be enforced in the forthcoming years. The most exciting location was probably the wall of the gate tower which once defended the entrance to the inner bailey. We have most probably found the remains of the vaulted gate and a brick floor in the adjacent building which may have been the kitchen. We were also digging in the Lakatos bastion where we found large beam holes in the walls showing once there was a strong wooden construction there. We have dug out many ruins from the prison house but there were not much findings in those ruins. Still, many ceramics, some nails and 2 coins were found during the week. It made the people excited and enthusiastic to complete the hard work every day. Hopefully we will have the opportunity to report about an exhibition soon where we plan to show these findings to the local people and to everyone who travels in the small village of Szögliget. 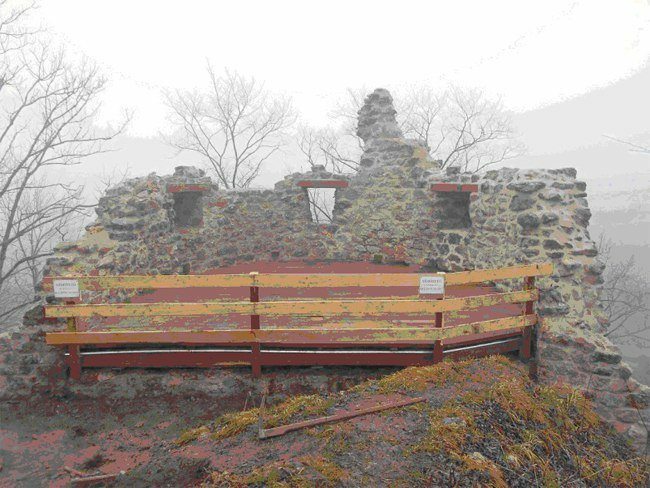 The conservation of the Csonka (Truncated) tower concluded this year. Despite its name this building still has 40 feet high walls. It was the only tower of the castle which was not completely demolished by the Austrian forces in the 17th century and it survived the last 300+ years in quite good condition. It was named after the damages during the siege of 1567. See No. 14 on the layout for the location of the tower. The wall which closed the building from the inner bailey (south side) was found during the summer excavations. The different construction phases could also be identified. Connecting walls were also found with the possible entrance but the stones of the door-step did not show (if there were at all). The adjacent wall on the eastern side was also cleaned and reinforced. So far the water was flowing from the inner bailey to the inside of the tower slowly weathering the walls. But the top of tower is now covered by a wooden roof which is constructed to lead the rain the other way around – back to the inner bailey. This building will be a lookout-tower for the tourists once it is going to be permitted for use. The Csonka Tower in December 2014. A strong cyclone brought extreme rainy weather around the area for a couple of days in October. Unfortunately we have chosen exactly that time for our next event. The 2nd day the rain stopped in the morning so volunteers could climb up to the castle and start cutting the plants off the walls. But only after a few hours of work the rain started to pour again so we had to leave the castle with some remaining bushes. Some of the volunteers could stay and went up on the 3rd day as well. At least we could clean the cellars and the bushy places which made us satisfied. In the meantime we keep working on tenders to find sources and gather funds to be able to continue saving the castle. We really appreciate all the help we received during this year. Thank you for supporting us with donations and your priceless voluntary work. Special thanks to our partners who were standing by us in this year just as they did before. Remember: The Castle is Yours!